Congratulations on being awarded the National Science Foundation (NSF) Graduate Research Fellowship (GRF) (or a similar remunerative, competitive, national fellowship)! Whether you’re a prospective grad student or a current first- or second-year PhD student, this fellowship is a great boon to your research, your CV, and almost certainly your finances. However, you may not yet realize that your finances will become a bit tricky once you start receiving your fellowship. With the help of this article, you can avoid the pitfalls associated with fellowship income and fully capitalize on the benefits. I’m sure you didn’t miss this headline info about the NSF GRFP: The fellowship pays you a stipend of $34,000 plus $12,000 of educational expenses to your institution for three years. Awesome! At the majority of universities in the US, that stipend amount is well above what you would be paid if you didn’t receive the fellowship, so you’ve effectively achieved a raise for the next three years. But the good news doesn’t stop there: Your university/department might confer even more benefits upon you for winning independent funding. If the administration isn’t forthcoming about these additional benefits, it is appropriate to inquire about them. Your new outside funding may give you a degree of independence in your research that you wouldn’t otherwise enjoy. This is highly dependent on your field, department, and advisor, but the fellowship may enable you to take your doctoral research in a direction that you advisor couldn’t or wouldn’t have supported without it. Perhaps you could take a risk on a side project, establish a new collaboration, or take extra time to rotate through a lab to gain new skills. Not all departments offer additional funding to NSF GRFP recipients, but it’s worth inquiring about with your advisor, the administration, and current NSF fellows at your university. Stipend supplements during the time that you receive the NSF GRF are more common in high cost-of-living cities where the departmental base stipend is near $34,000/year to begin with. For example, searching “NSF” in the PhD Stipends database reveals stipend supplements awarded during the NSF GRFP years to students at the University of California at Berkeley, Northwestern University, and Columbia University, while a student at the University of California at San Diego writes that he/she received no funding incentive for winning the NSF GRF. You’ll never have more negotiation power than you do as a prospective graduate student with an outside fellowship in hand. Unfortunately, you don’t have a lot of time to negotiate as the NSF GRFP awards list comes out approximately two weeks before grad school decision day, April 15. As quickly as possible, you need to clarify if the offers from the universities you are still considering are going to be sweetened at all now that you have your fellowship. If the financial package from your preferred university isn’t up to par with your other offers (after considering cost of living differences), you can tactfully ask if a bonus, stipend supplement, or guarantee of future funding is possible. There are two vital questions you need to ask of your department before you can begin creating a budget for your NSF GRF stipend. After the fellowship ends, what will my stipend be? How frequently is my fellowship disbursed? Your lifestyle roughly matches that of your peers in your department. You can relatively quickly achieve financial goals such as saving or debt repayment. If your income is set to drop once the fellowship ends, you avoid acclimation to the higher, temporary income and don’t have to make major lifestyle sacrifices once the three years are up. 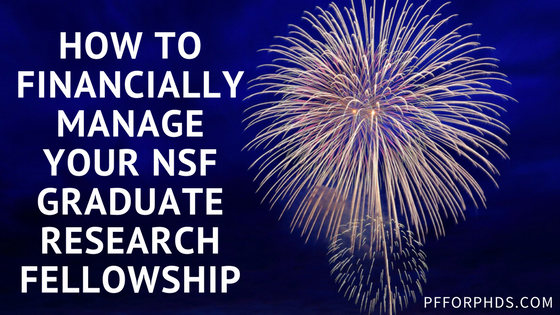 This strategy is easiest to implement for graduate students who start the NSF GRF after one or more years in grad school. Just put all of your ‘raise’ toward financial goals and don’t change anything about your lifestyle! Prospective grad students will have to be more conscious about setting up their grad student lifestyle on a lower income than they will start out with. If you choose to upgrade your lifestyle with your fellowship stipend, be careful to maintain any long-term financial contracts at a level that will be sustainable for you after your income drops (if it will). The two key areas to watch out for are housing and transportation expenses. While it is possible to reduce your spending in either of these areas during grad school, it is a painful process, so it is preferable to lock in your spending in those areas at a level that you can maintain long-term. Sometimes, fellowships are disbursed to the recipient at a frequency other than monthly, e.g., once per term. This schedule can cause issues for budgeting, which is usually framed as turning over each month. One of the advantages of an infrequent disbursement schedule is that you are paid at the beginning of the period rather than the end, so the money you need throughout the period is already available to you. However, you may not be able/inclined to use typical budgeting software functions and prefer to set up your own budgeting system. One of the most useful budgeting concepts for people with irregular incomes is that of fixed vs. variable expenses. At the beginning of your budgeting period, project the fixed expenses that will be paid during the period, such as your rent/mortgage, debt payments, certain utilities, subscriptions, etc. Then allocate your remaining income to your variable expenses at a frequency that is convenient for you. For example, you can estimate the variable utility bills that you may pay monthly during the period, plan to spend no more than a certain amount of money each week on groceries, and give yourself a lump sum of money for entertainment for the entire period to be spent as opportunities arise. In this way, allocate your fellowship disbursement so that you are sure that your expenses won’t exceed your income (leaving some buffer for unexpected expenses). However, the taxation of fellowship stipends is handled completely differently by universities than assistantship pay. While assistantship pay is reported on a W-2, fellowship stipends are not required to be reported in any particular way. A large fraction of universities, possibly the majority, do not report outside fellowship stipends on any official tax form. At most, the fellow might receive a courtesy letter, which is an informal letter stating the amount of the fellowship stipend received during the calendar year. Some universities report fellowship stipends on Form 1098-T in Box 5 (along with other scholarship and grant income). A small minority of universities report fellowship stipends on Form 1099-MISC in Box 3. Whatever reporting mechanism used or not used, the important information to bring to your tax return preparation process is the amount of fellowship stipend paid to you during the calendar year. From that point, the fellowship stipend income is treated the same as any other fellowship/scholarship/grant income, and (possibly after some adjustments) it will ultimately be taxed as ordinary income. This means that you will receive 100% of your gross fellowship stipend instead of your stipend net of income tax as you would assistantship pay. However, the IRS still expects to receive income tax payments throughout the year, so you will have to look into filing quarterly estimated tax. As a default position, you should assume you are responsible for paying quarterly estimated tax. It’s possible that you won’t be required to in the year you switch on or off of the fellowship or if you’re married to someone with a high income and high withholding, but even in those cases it’s prudent to check. The way you calculate your quarterly estimated tax due (and figure out if it’s required of you) is by filling out Form 1040-ES. That form will give you the amount of the payment you are supposed to make four times per year and an estimate of your total tax due for the year. You can make the payment online at IRS.gov/payments or through a host of other mechanisms. Whether or not you are required to file quarterly estimated tax, it’s a great idea to set up a personal system that simulates automatic tax withholding. Open a separate savings account labeled “Income Tax” and transfer in the fraction of each paycheck you receive that you ultimately expect to pay in tax each time you are paid. Then, draw from that savings account when you make your quarterly or yearly tax payments. This upcoming weekend I’m running an online workshop to help fellows file quarterly estimated tax. This is my first time giving the workshop, but if it goes well I plan to repeat it at least twice per year. If you would like to join my mailing list to be notified about future iterations of this workshop, please enter your information in the form immediately following this paragraph or at the end of the article. The upside of receiving the NSF GRF is that your income is most likely higher than it would have been, which means you have an increased ability to achieve financial goals during graduate school such as debt repayment, saving, and/or investing. The downside of receiving the NSF GRF is that the stipend is not considered “taxable compensation” or “earned income.” It is taxable income, as discussed in the previous section, but it is not “compensation” or “earned.” If you receive only fellowship income in the course of a calendar year (and you’re not married to someone with taxable compensation/earned income), you become ineligible for certain tax benefits. The lost benefit that most commonly concerns graduate students is the ability to contribute to an Individual Retirement Arrangement (IRA). An IRA is a tax-advantaged retirement savings vehicle. It’s a great idea to use an IRA (or other tax-advantaged retirement vehicle such as a 401(k) or 403(b)) for your retirement savings as it helps you maximize your long-term rate of return by protecting your investments from taxes. As a graduate student, you almost certainly don’t have access to the university 403(b), so the IRA is basically the only game in town for tax-advantaged retirement savings. The catch is that you (or your spouse) must have taxable compensation during a calendar year for you to contribute to an IRA for the year. So if you go an entire calendar year with only fellowship income (you don’t have compensatory income from an assistantship or outside job and you’re not married to someone with taxable compensation), in that year you’re not eligible to make any IRA contributions. It’s a catch-22: While you are likely more financially capable than ever of investing for the long term, you’re barred from doing so in a tax-advantaged retirement account. I don’t think your inability to contribute to an IRA should stop you from working on your financial goals. It may be that you choose to prioritize another goal over retirement savings as a result of not being able to use an IRA, e.g., paying down student loans. But if saving for retirement is your top priority, you should pursue it; just use a taxable account instead of an IRA during any years of ineligibility. Your tax burden can actually be quite low during grad school if you choose a long-term, low-turnover investing strategy. If you are single and your income in 2019 is below $39,375, your long-term capital gains and qualified dividends will be taxed at 0% at the federal level (you may still owe state and local tax). So it’s really not too bad to save in a taxable account as long as your income stays low. When you have access to an IRA or other tax-advantaged retirement account, you can probably shift your taxable assets into that account time to maximize the growth rate in the long term. What other questions do you have about financially managing your NSF GRF stipend?